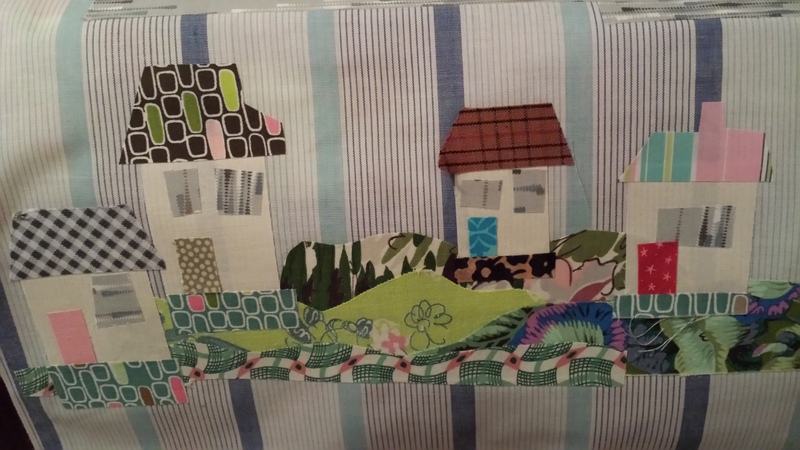 I am excited after spending a weekend sewing and quilting with friends at a 3 day quilt retreat. 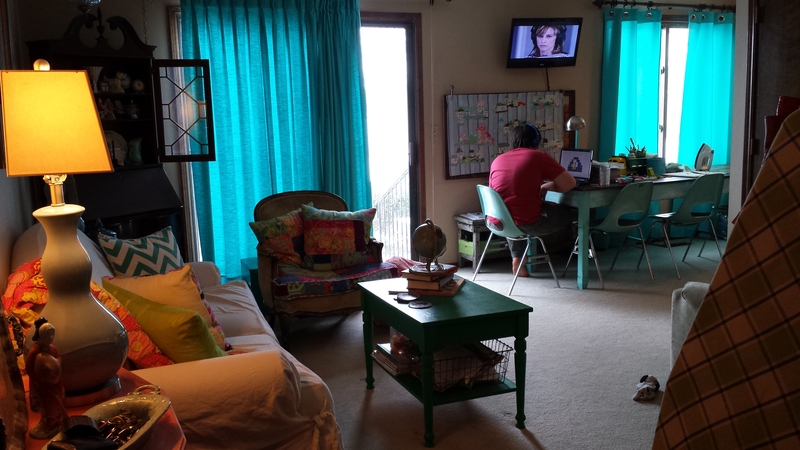 I have never taken a trip that revolved around creating, designing, and playing with fabric. has been dancing in my head. I only took fabrics that were my very favorites. The cherished stash of skirts, blouses, sheets and pillow cases, tea towels and vintage fabrics cut from aprons that both of my grandmothers made and used. You have to pack carefully when sewing away from home! It was a challenge. I wasn’t sure how much I would accomplish, but I wanted to have enough to keep me busy for 2 whole days of sewing uninterrupted! 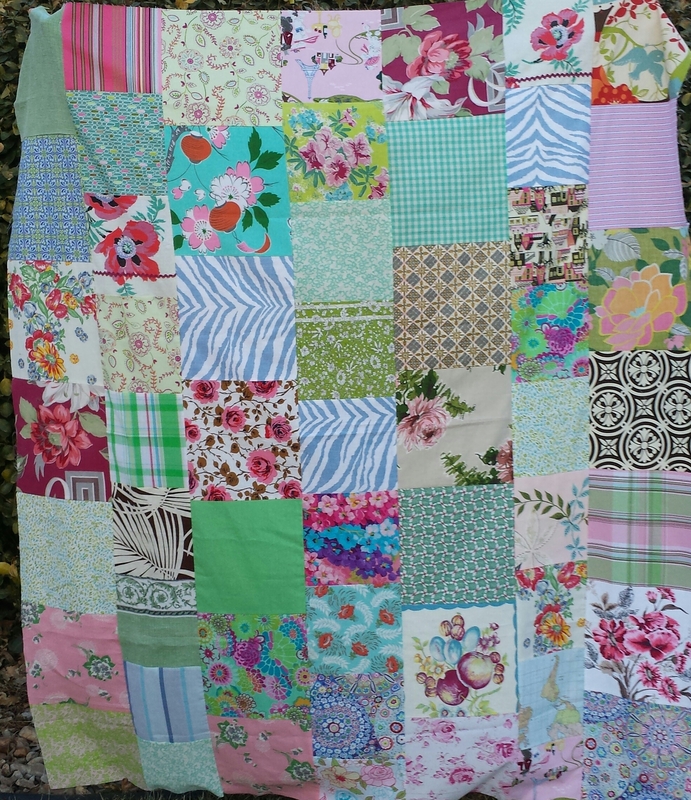 The patchwork top (not quilted yet) is made up of 7 rows of large 8″ and 10″ square blocks. I just made up my own thing.. it’s “what I had and loved”, and I didn’t want one scrap that wasn’t a “MUST HAVE” to get in the way. 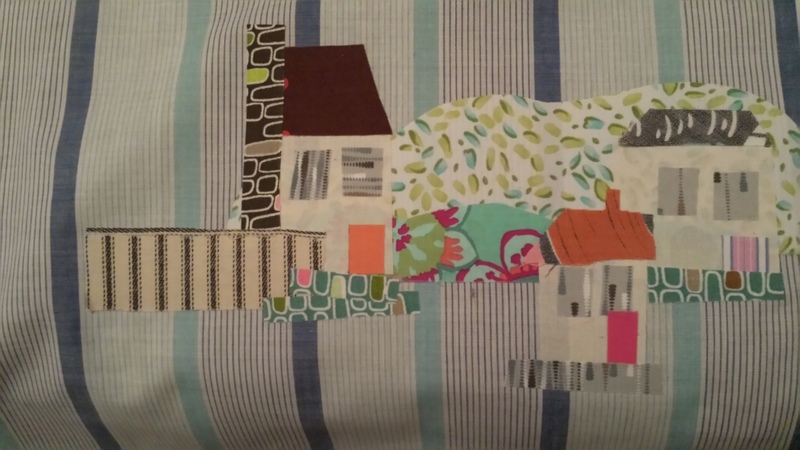 Speaking of scraps: I knew I would have wonderful scraps falling from my little squares as I cut my quilt top to size. 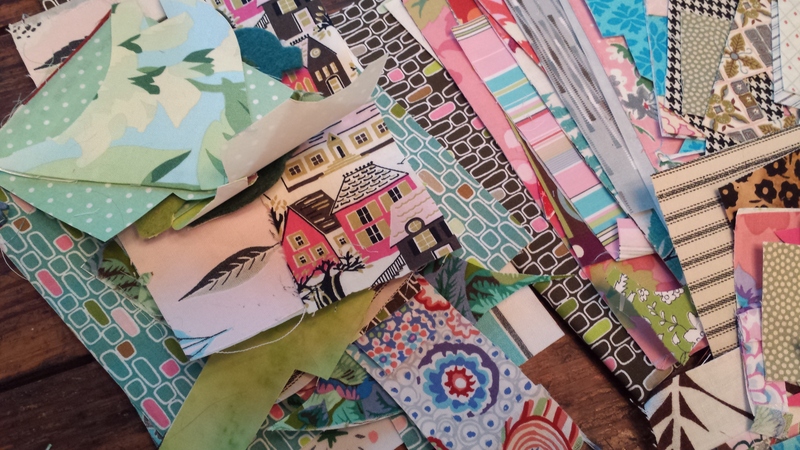 And if my scraps were wonderful… who knew what scraps I might find in a room full of quilters? I packed Pellon Wonder Under to take advantage of the awesome scraps of color that I knew would fall away from the tables around me as women sewed. The gals are all so generous, if there is a bit or piece that you can use, and they have no use for it, it becomes fair game. JOY to be there! 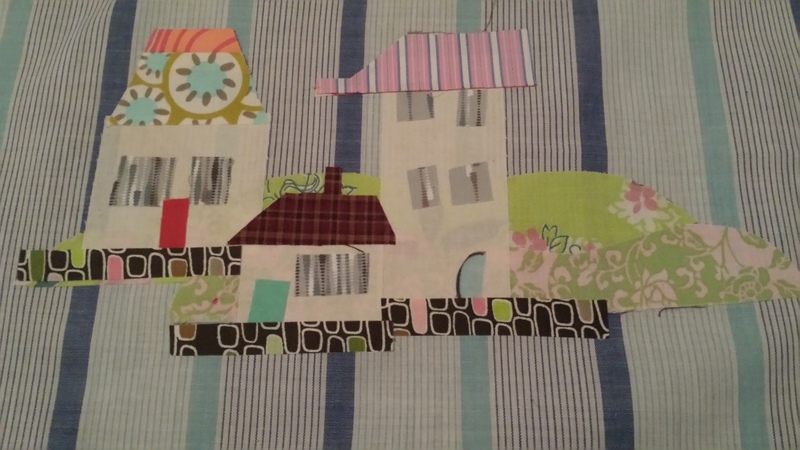 I have also had this little project dancing in my head: A collage of tiny houses made of scraps. 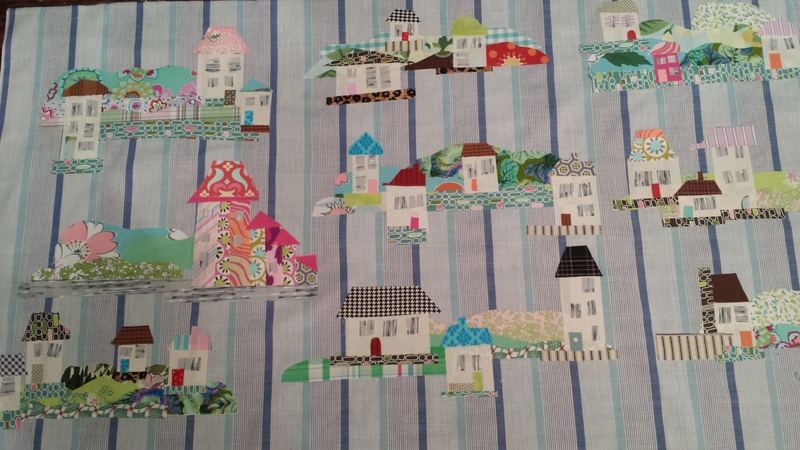 Laying out the landscape and size of the houses. 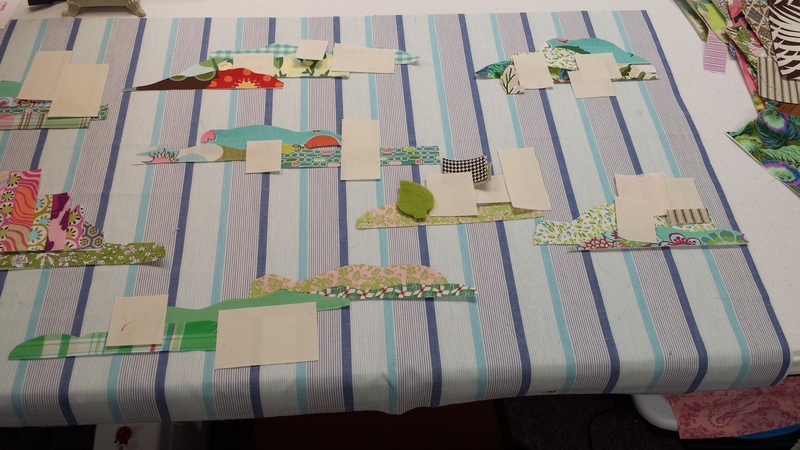 I just laid the scraps on the Wonder Under and ironed them on in strips, squares and bits – filling the gaps and overlapping so that my iron would not stick. 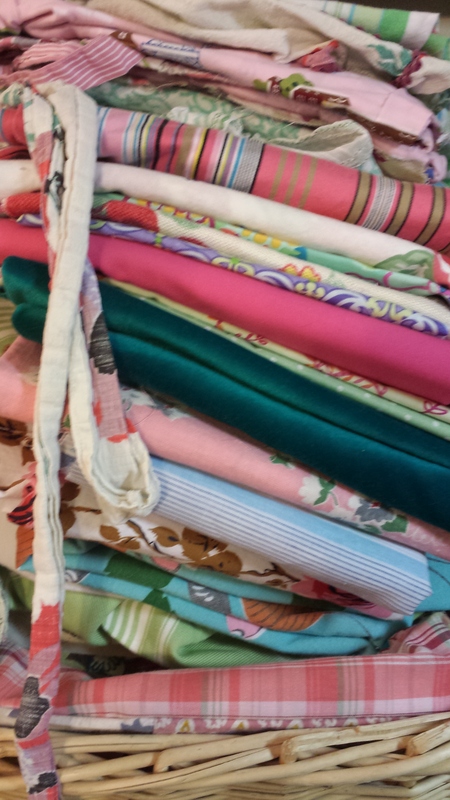 Then I cut my scraps and stacked them by color. 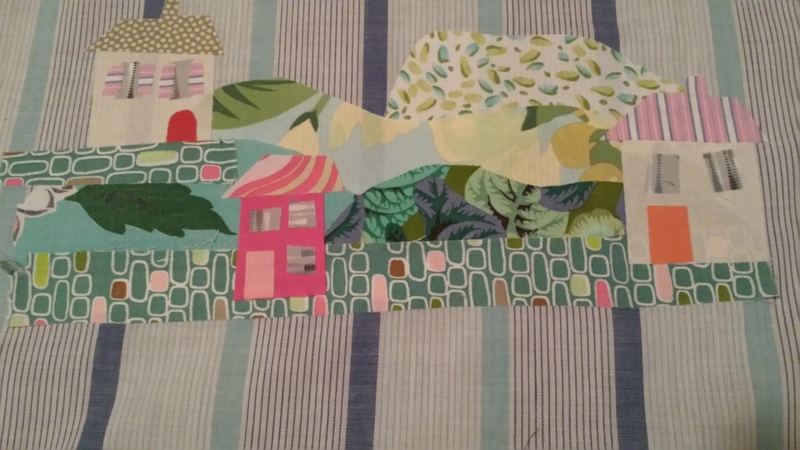 Looking over the little rough sketch, I cut roofs and windows and rolling hills with fabrics that told the story I was after. Decorating the houses was so much fun. I can’t wait to embellish them! Little pink houses for you and me. 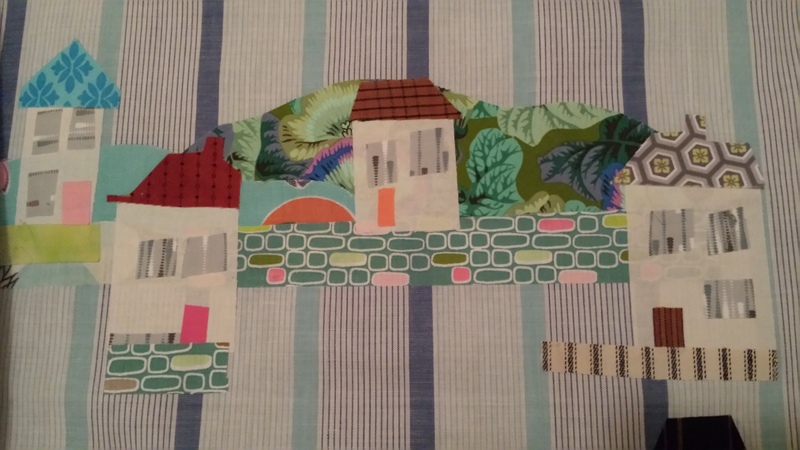 Once I was happy with my layout, I peeled the paper off the back and ironed my little houses and roofs down. Later I will outline with stitching and colorful thread. Some bits will be quilted and fluffy.. others will have embellishments of ribbon or trim, or beads. 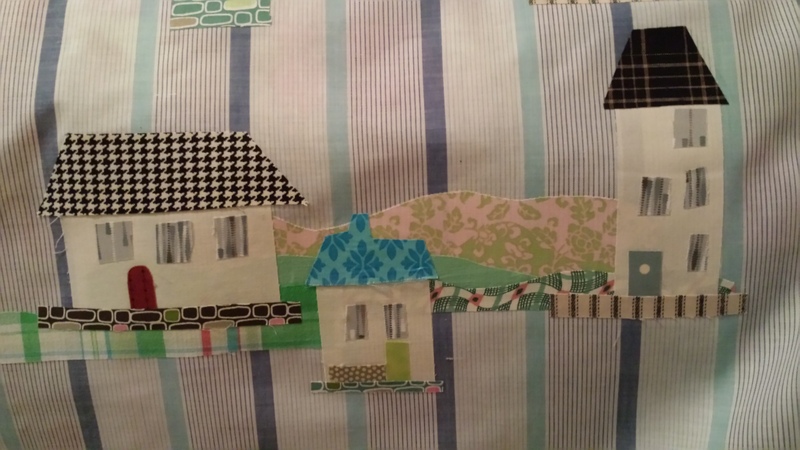 Each house on this scrap of fabric represents a house I have lived in – some for only a few months, some for many years. There are 26 at present, we can talk about my issues later, I am sure…. Eventually, I would love to place the little house appliqué in the frame of the kitsch Arkansas farm-house “painting” in the dining room. 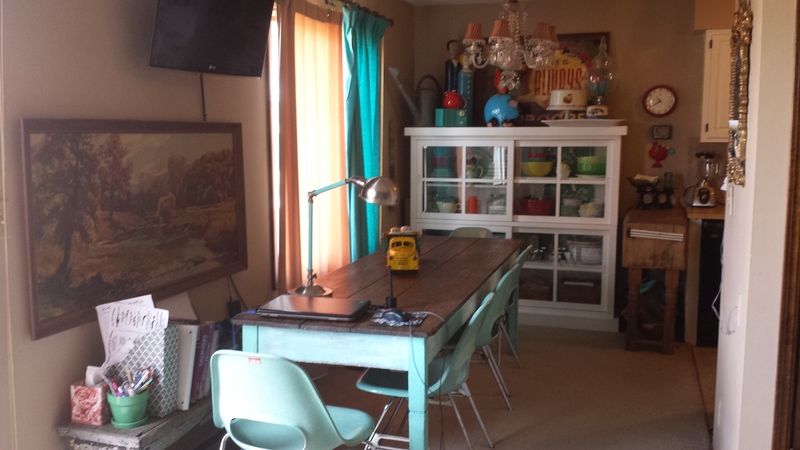 I love when a trip away from home changes how you view things, allows you to re-imagine the space you live in! I cannot tell you how much fun it is to be with women who love to create, who are as obsessive and in love with their projects as you are. If you have the opportunity to escape and create with friends, do it and live every minute of it! Happy creating! I will share more when these works in progress are completed. For now, we’re just hanging in there.. no pun intended.